Identifying Fracture Types – All Things AAFS! 01/09/2013 by All Things AAFS! This blog post is the 3rd in its series on bone fractures. To view the first blog post on the basic fracture types and information, including open and closed fractures, click here. This blog post will highlight some of the common ‘named’ fractures you will often find in archaeological and anthropological settings. It is important to know their characteristics and common causes to help establish what happened – whether the fracture was received by defensive or offensive action, or purely accidental. This blog post will examine the first five common fractures associated with the hand and forearm bones. 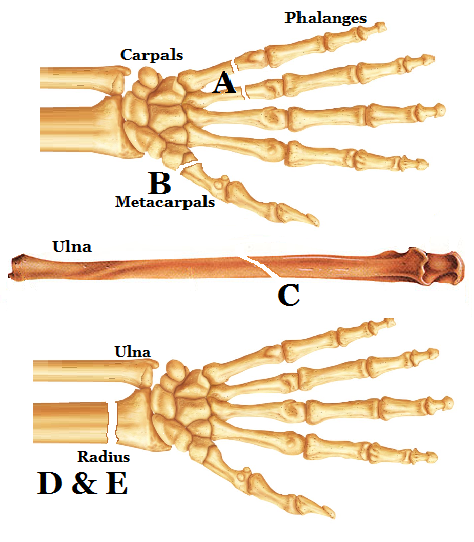 Common ‘Named’ Fractures of the forearms and hands: A) Boxer’s fracture, B) Bennett’s fractures, C) Parry’s or Monteggia’s fracture, D) Colles’ fractures, and E) Smith’s fractures. A) Boxer’s fracture: This fracture occurs due to the axial loading, meaning a force was applied along/parallel to the axis of the bone, on the transverse neck of the 4th and 5th metacarpal, secondary to an indirect force. A Boxer’s fracture often happens due to punching an object/person with a closed fist, hence the name ‘Boxer’ being associated to it. B) Bennett’s fracture: This fracture affects the 1st metacarpal (thumb) and extends into the carpometacarpal (CMC) joint which is complicated by subluxation (dislocation of a joint). A Bennett’s fracture is an oblique (See 1st blog post for meaning, click here) intra-articular metacarpal fracture caused by an axial force directed against the partially flexed metacarpal. This injury is also common when someone punches a hard object, but its most common cause is falling onto the thumb. An example of this is falling off a bike, as the thumb is extended around the handle bars. C) Parry’s/Monteggia’s fracture: This fracture occurs on the proximal third of the ulna with subluxation of the radius/ulna. The most common cause of this fracture is by blunt force trauma caused by lifting the forearm up to protect the head or body in defence from an oncoming attack/striking object. D) Colles’ fracture: A Colles’ fracture, also known as a “dinner fork” or “bayonet” fracture, occurs when the distal radius is broken with dorsal displacement of the wrist and hand. This fracture is common when the person falls forwards and uses their outstretched hand to cushion the fall, which causes the force to displace and break the head of the radius. E) Smith’s fracture: A Smith’s fracture is the same as the Colles’ fracture but with ventral displacement of the broken radius head. The cause of a Smith’s fracture is the same as the Colles’ fracture, but it is less common. 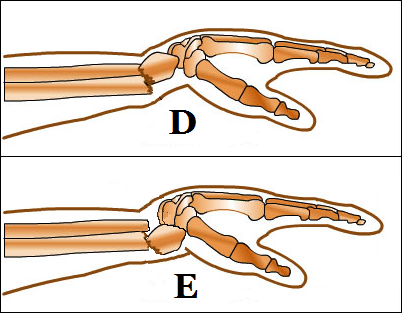 Fractures: D) Colles’ fracture, and E) Smith’s fracture. The next Quick Tips post will discuss other ‘named fractures’ in archaeological/anthropological situations and their causes and characteristics. This is the third post of a set on fractures, so keep your eyes open for the other posts, and the new ones to come. To view all the other Quick Tips posts click here! 09/08/2013 by All Things AAFS! Quick Tips: Fracture Types – The Basics Pt 2. In my previous Quick Tips, which you can find by clicking here, you were introduced to the first six basic types of fractures, what the main causes of fractures are, and the two main categories they are classed in. It is important that you know the information in the previous Quick Tips post before learning these last few basic fractures, as it discussed the fundamentals of fractures. Fracture Types: A) Butterfly, B) Longitudinal, C) Segmented, D) Hairline, and E) Avulsion. A) Butterfly Fracture: Butterfly fractures usually affect long bones and can be caused by car accidents or by being knocked side on. B) Longitudinal Fracture: As a transverse fracture is a bone along the horizontal axis, a longitudinal fracture is along the vertical axis. C) Segmented Fracture: This is when the bone has fractures in two parts of the same bone causing the bone to break into larger bone fragments which are separated from the main body of a fractured bone. D) Hairline Fracture: These fractures are also known as ‘stress fractures’. These types of fractures are very difficult to diagnose and once they heal there may be no evidence left to see. These are very difficult, if not impossible to identify when in an archaeological context. E) Avulsion Fracture: Avulsion fractures are characterised as the separation of a small fragment of bone at the site of attachment of a ligament or tendon. The next Quick Tips post will discuss the ‘named fractures’ that can be discovered in archaeological contexts, such as the familiar Bennett’s and Parry’s fracture, and their origins and common causes. This is the second post of a set on fractures, so keep your eyes open for the other posts. To view other Quick Tips posts click here!